To be fair, I had already read four of the nine short stories presented in this collection, and so kind of skimmed them a second time while reading through Stars Above. I probably wouldn't mind rereading them, especially The Little Android or Carswell's Guide to Being Lucky, but since they are still fresh in my mind from reading them very recently, I decided to mostly skip them. Nonetheless, the five brand new short stories were just as excellent to enjoy; entertaining with that nostalgic feeling you get when encountering an old friend. I know it hasn't been long since the ending of Winter (and with it, the ending of the Lunar Chronicles series), but it doesn't hurt to see our gang of beloved characters once again in different forms. This short story details the time before the series begins, focusing on Michelle Benoit and young pre-teen Scarlet. We get to see a lot of the thoughts going through both these ladies minds and especially the situation surrounding Michelle Benoit's involvement with Princess Selene's rescue and subsequent life-altering events. It's slightly monotonous, but DOES manage to answer some questions that fans might be asking about Scarlet's grandmother's life before she was presented as a crazy old woman who gets captured for her knowledge about Princess Selene. I read both of these short stories some time, a little under a year ago at the beginning of 2015. I recall enjoying both, as they give a slight insight into the young lives of Cinder and Wolf. Glitches details the moment that Cinder is brought to the Eastern Commonwealth--on top of that, giving us another reason to thoroughly despise her stepmother and stepsister, Pearl. The Queen's Army details the moments when Ze'ev Kesley becomes Wolf as he is taken from his family and forced into servitude under the guise of honorable allegiance to Queen Levana. Both were interesting back stories for two of our main characters, and though they may not have been the most exciting, they were written very well, with some heart-tugging tinges and I recall really, really liking them. I read Carswell's Guide to Being Lucky previous to this Stars Above collection as well and absolutely adored it. I'd have to say that it might have been easier to like after reading Cress because I was already thoroughly in the "I ♥ Thorne!" camp. So seeing him as an overly ambitious child with his typical sneaky ways was quite interesting. Here is a link to my previously written brief review. After the Sunshine Passes By is cute and short, just like Cress. It gives us a brief look at Cress as a child and how she came to be imprisoned in her satellite as a slave to Levana as the Lunar’s most powerful spy weapon. The Princess and the Guard could be my favorite of the short story collection. The story presented shows us the events leading up to young Winter’s decision and determination to never use her Lunar gift. It also gives us a look at the relationship between Winter and Jacin before both of them lost their childhood innocence and naivete to Queen Levana’s power hungry evils. It is a bittersweet story and further cements that Winter and Jacin are my favorite of the romantic couples in Lunar Chronicles. While I love all the characters and love all the interactions and relationships, the romance couples in the series never really stood out for me, and instead, I loved all the friendships a whole lot more. Winter and Jacin’s love story is somehow simple and sweet even despite it not really being quite so simple. The Little Android is another of the short stories I read prior to the Stars Above publication. One of my more favorite stand-alone fairy tale retellings, The Little Android takes place in the Lunar Chronicles world and even gives us a brief glimpse of Cinder before the events of the series, but it stands by itself just fine. See my short review of this short story. I see how The Mechanic would be placed as the second to last short story in this collection as it kind of gives you a board to jump off of into the last short story in this collection. The Mechanic gives us a brief look into Prince Kai’s side of his first meeting with Cinder and what’s going through his mind at the time. I had always viewed Kai as a standard, carbon-copy storybook prince with no outstanding… anything. Let’s face it, for the first three books, he’s the one with the grand conflict, but he’s also the one with the most boring character description and I really didn’t care much for him. It made it hard to care for the main series’ storyline romance no matter how much I adored Cinder and her development throughout the entire series. But then came Winter and Kai did a complete one-eighty and surprised me and I finally found something about him that I liked--when pushed to the snapping point, I kind of like the new Devil May Care behavior he exhibited in the concluding book. And The Mechanic also gives more of a personality to Kai outside of “Potential Princely Love Interest” to Cinder. I definitely approve, which is why I gave this story such a high rating when others seemed not to care for it so much. Finally, as the title of this short story will tell, this last one brings us to a final conclusion of the entire series altogether with a wedding. I think it’s the reunion and gathering of our nine favorite characters that really seals the LOVE factor in this last short story. Because there was so much cheese and so much tacky that I couldn’t help feeling second-hand embarrassment for the characters themselves for their dialogue and how everything just seemed kind of "Couple Curtain Call" tacky. I'm not a fan of Couple Curtain Calls, because a lot of times it's just a sloppy way of concluding a series or a story with a cheesy Happily Ever After to make the hopeless romantics in all of use swoon. But what am I complaining about? Wedding’s are always about the gushy cheese and this story was definitely gushy romantic. And we get to see all of our favorite couples being couples and we get to see Iko being her typical flamboyant android self, and everyone else just hangs out in a peaceful way and things come to a lovely Happily Ever After. So I'm absolutely content with how this story turned out. Especially since Marissa Meyer manages to handle the Curtain Call quite well anyway. And then there’s Thorne. There wasn’t much of Thorne, and to be honest, he felt kind of mellowed out in this story, but Thorne was here and I love that I got to see Thorne again. Stars Above is that perfect wrap-up for fans of a series who just want to see a little bit more of their favorite characters in their favorite world. It’s a nice little treat without having to go digging for fanfiction or writing your own possible post-series scenarios in your head, just to continue living in that world you fell in love with. 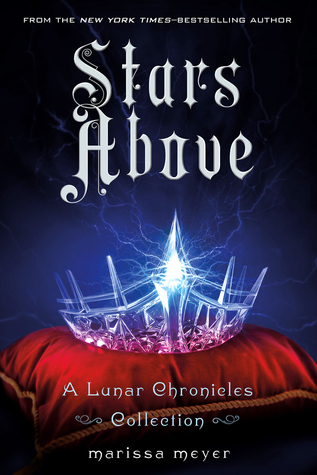 Overall, this is an enjoyable collection of short stories that fans of the Lunar Chronicles will be sure to love.